Which home-improvement retailer looks more attractive at today's prices? Another fiscal year is closing, and the battle between Home Depot (NYSE:HD) and Lowe's (NYSE:LOW) looks much like it has for years now. Home Depot dominates across the board in operating statistics including market share and customer traffic, while also producing stronger profitability and better financial returns. Yet Lowe's, under new management, is taking aggressive steps aimed at closing that performance gap beginning in 2019. With those broader trends in mind, let's stack the two home-improvement giants against each other as investment candidates. Sales growth is at existing locations for the 2018 fiscal year, including management's fourth-quarter projection. Profit margin is for the trailing 12 months. Data sources: Company financial filings and S&P Global Market Intelligence. In just about every operating and financial metric worth tracking, Home Depot comes out ahead of its smaller peer -- and by a widening margin. Sales in 2018 are on pace to expand by about 6%, or twice Lowe's rate. And Home Depot has managed modest but positive customer traffic growth through the first nine months of the year as Lowe's lost traffic. The profit picture is even more lopsided. 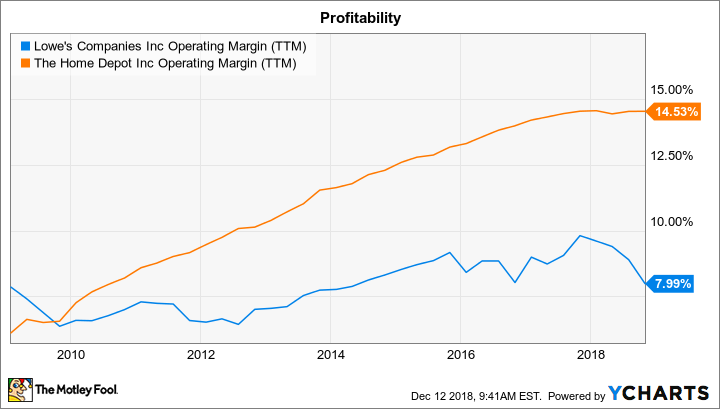 Home Depot's firm pricing trends have allowed operating income to rise at roughly the same pace as sales so that its margin held steady at about 14%. Lowe's, in contrast, has seen operating income dive to $4.6 billion, or 8% of sales, from $5.5 billion, or 10% of sales, in 2017. The performance gap has widened in this area lately as Lowe's struggles to execute around core retailing competencies. The retailer failed to stock appropriately for the seasonal demand uptick in the fiscal second quarter, for example, which led to lost business. The problem bled into the third quarter, too. "Continued challenges with inventory...poor reset execution, and assortment concerns," CEO Marvin Ellison told investors in November, "pressured our ability to turn [additional customer] visits into [sales]." Both retailers made positive comments about the health of the broader industry in their latest earnings updates, and that optimism contrasts with the darkening investor mood that's sent both stocks lower in 2018. It's especially hard to square Home Depot's weak stock performance with the fact that management has raised its top- and bottom-line outlook in each of the last two quarterly reports. Thus, choosing Lowe's over its bigger rival would amount to a bet that new CEO Marvin Ellison, who spent many years as a top executive at Home Depot, can turn things around for Lowe's. Ellison isn't shying away from aggressive moves, at least -- including shaking up the chain's management team, announcing store closings and brand divestments, and restructuring Lowe's inventory and supply chains. His goal is to create a world-class retailing business, and these initiatives would advance that strategy -- if they work. However, there's no evidence yet that Lowe's rebound plan is making it more competitive. In fact, the retailer is giving up more market share to its bigger rival with each passing quarter. Until that trend flips around, or at least stabilizes, it's hard to see why an investor would want to bet on Lowe's today over its far more profitable and faster-growing home-improvement peer.